As our One-Pot Blogger Party ends, we conclude with a hearty pot of Tuscan White Bean Soup—with soup, there is always enough for everyone. 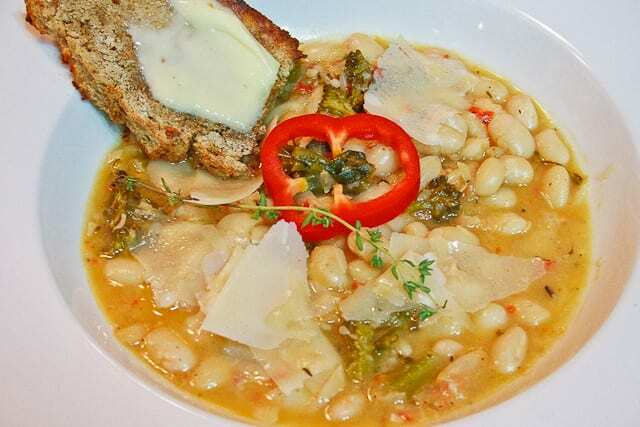 Tuscan White Bean Soup with Broccoli Rabe is one of the recipes we are allowed to share in full, so I couldn’t pass up making a pot at home too. In a house full of carnivores it was hard to imagine making bean soup without ham or smoked turkey, but I wanted to stay as close to the original as possible. Uncertain as I was about the lemon component of this soup, it worked! It subtly blended into the background of the broth brightening other savories as well as the broccoli just a bit. I highly recommend cannellini beans—a larger, plump white bean with a creamy texture—and as with any soup, homemade stock is ideal for the base. I hope you’ve been saving your Parmigiano-Reggiano cheese rinds (I have extra if you live close-by) it is a wonderful flavor boost. Of course, shaved Parmesan to top it off is good too! This is a comforting, hearty soup with flavors reminiscent of northern Italy with cannellini beans. Emeril’s Sizzling Skillets and Other One-Pot Wonders is now available! “BTL” Risotto and more than 130 other delectable recipes are compiled in this great cookbook. Just click on the link or the photo to order yours and start enjoying them today. Disclosure: For my participation in The Secret Ingredient’s One-Pot Blogger Cooking Party, I received a copy of Sizzling Skillets and Other One-Pot Wonders, a jar of Emeril’s Essence seasoning, and a set of Emeril – by zak! Table Art 7-piece. Once the party concludes, upon my successful completion, I will receive a $50 grocery reimbursement and a set of Emeril’s cookbooks. Really, no one pays much attention to all the “gee, this looks good” remarks, but those who are serious about trying this recipe would love to hear from cooks out there who have actually tried this soup. Anyone? Thanks for linking up to Momtrends this week. I need to find some Broccoli raab. looks delicious. thanks for sharing with Hearth and soul blog hop. Looks divine! Thanks so much for sharing on Friday Food with Momtrends. I have recently fallen hard for Broccoli raab, so this soup really caught my eye! Thanks for sharing with the Hearth and Soul. Yes this looks lovely – I do like a bean soup – so filling and nutritious! It is amazing what a squeeze of lemon can do to dishes too isn’t it? Wow, this looks really delicious! Broccoli raab, aka wild mustard, grows wild in my area, and its just starting to come into season. Together with white beans and homemade broth, this soup sounds absolutely delicious and frugal. I can’t wait to try it out! Thanks for sharing with the Hearth and Soul Blog Hop!!! 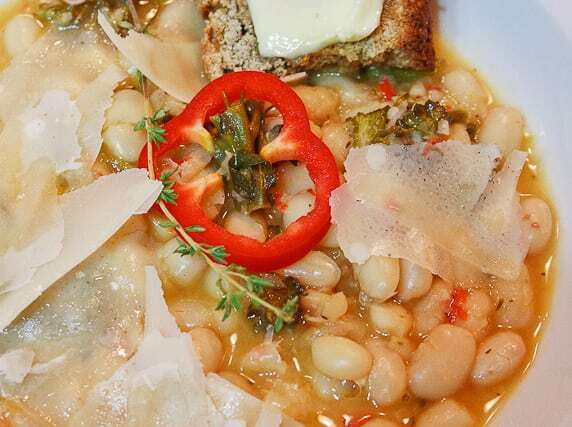 We just love a good White Bean Soup and your recipe looks delicious. Thanks for sharing and hope you are having a great week! We’ve got some broccoli rabe growing in the garden, so I’m bookmarking this recipe. Have a great Sunday! This looks like a really hearty and tasty soup! You certainly show it off well with your pictures. I made a pot of white beans today so this looks like a great recipe to use some of those beans. These recipes have been quite an adventures and it’s been enjoyable seeing what you’ve done with them. Great job Judy! What a great meal. This has been such a fun series! We’re going to New Orleans for Katherine’s birthday and one of the restaurants is a place Emeril once cooked at. When he was getting his start that is.